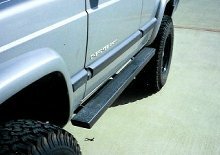 These heavy-duty rocker guards are built from 2x4x3/16" square steel tubing. They bolt to the rear spring hanger, pinch seam, and frame rail for a solid mounting. All pieces are black powder coated. Drilling is required for installation.